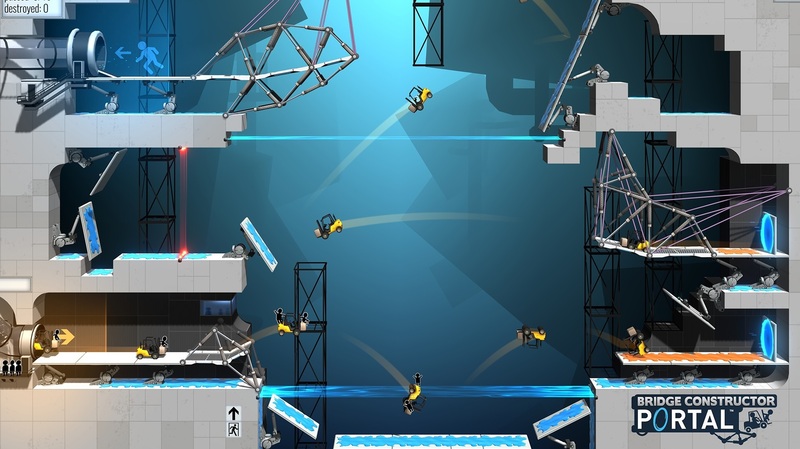 Bridge Constructor is an ingenious puzzle game based on physics that was first released on mobile platforms and later arrived on consoles and PC, in fact, it was one of the very first titles that we’ve reviewed on SGR. Technical issues aside, it had a very strong foundation (no pun intended) that made for a fun little time waster. After a couple of iterations on mobile devices (including a medieval version with horse carriages), Clockstone has taken a massive leap and reached out to Valve, of all companies, to strike a deal for one of their most popular IP’s, Portal. It might seem like an odd combination but it somehow works quite well, so well in fact that I find Bridge Constructor Portal to be the finest entry in the series yet. 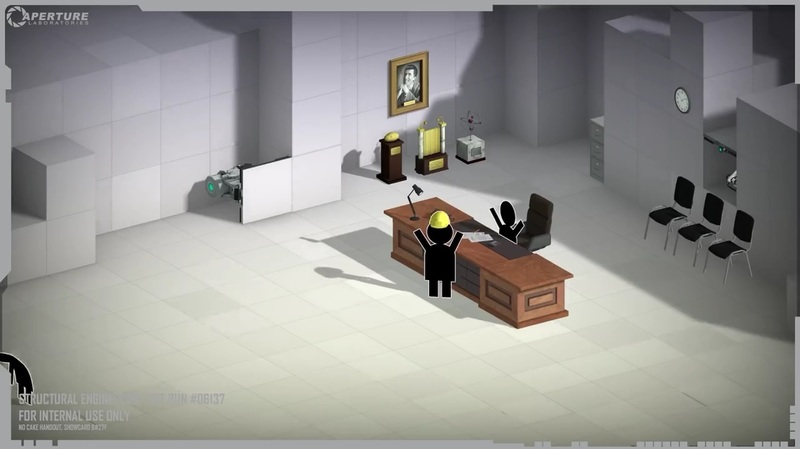 In Bridge Constructor Portal you take the role of a new employee in Aperture Science test labs and it’s your goal to safely transport your fellow co-workers around several treacherous test chambers. The basics of the gameplay will feel familiar to Bridge Constructor veterans. You’re still essentially plotting bridges piece by piece utilizing varied materials to create solid structures that can be safely used for travel while also keeping an eye on your budget. The first few stages are very simple affairs that teach you the nitty-gritty of bridge building, such as using triangles to build strong structures and how to use ropes to give your bridge a bit of flexibility. 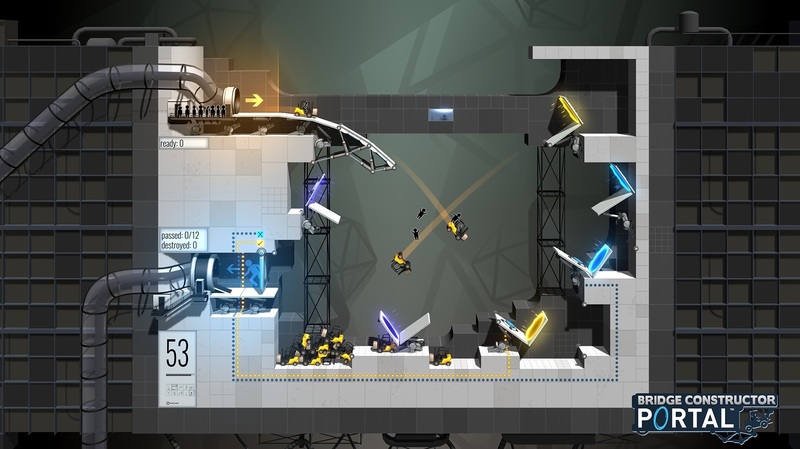 Eventually, you’ll start to run across some more complex challenges that use some items and hazards that are staples of the Portal series such as portals, propulsion and repulsion gel, aerial faith plates, cubes, and more that you must master to bypass sentry turrets, acid pools, and laser barriers. Each of the test chambers is preceded by helpful tips and witty remarks from GLaDOS who’s actually voiced by its original voice actress, Ellen McLain. It might not seem like much to the general public but little details like these really make Bridge Constructor Portal feel that much special. 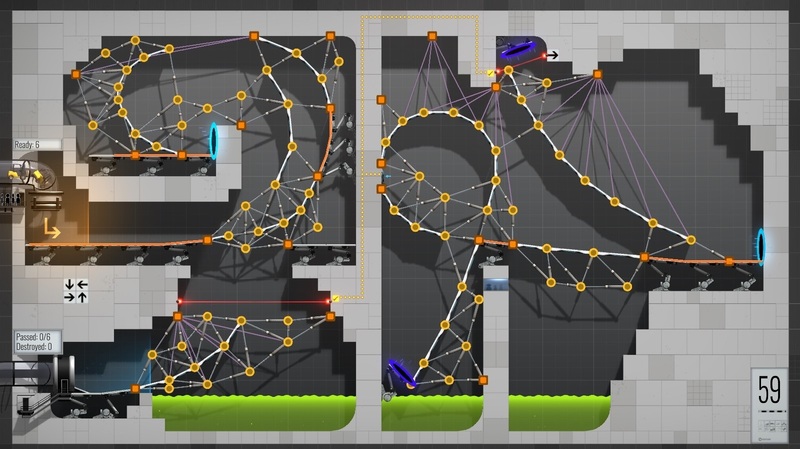 The traditional controls have received a few tweaks from the first release of Bridge Constructor on consoles, with dashed lines indicating if any of the adjacent pieces are within range and with the new ability to quickly plot several pieces at a time instead of having to place them one by one. These are certainly welcome additions but I feel that using traditional controls still doesn’t feel as intuitive and natural as using the Nintendo Switch touch screen. That’s how I spent most of my time with the game and it perfectly goes hand in hand with the ‘pick up & play’ nature of Bridge Constuctor Portal. The overall look of the game is very true to the source material, the Aperture Science facilities are extremely sterile and it’s somewhat bleak to see these little guys fall into pools of acid but that’s part of the beauty of it, it really feels like you’re playing something that’s part of that same Portal universe. The game’s performance was also a pleasant surprise with it maintaining a steady 60 frames per second on the Nintendo Switch both docked and undocked at all times. 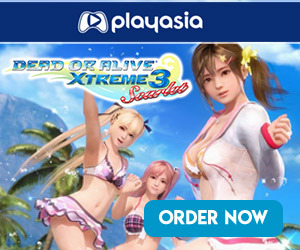 The game is not without a couple of flaws, however. Such as the complete lack of music during the building phase of the game which is the vast majority of it. This is a real shame especially while playing the game in docked mode as you’re left staring at a big TV screen in total silence. The game also tries its best to remain fresh until the very last of the sixty test chambers but it felt a bit tiring to play it for more than 30 minutes to an hour at a time. 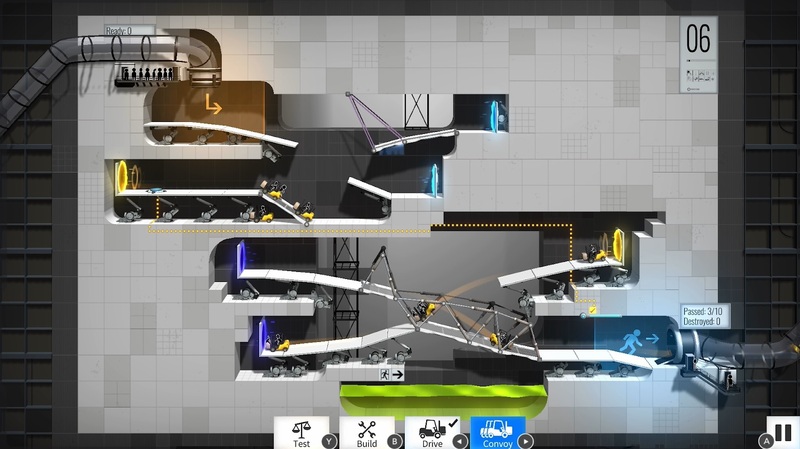 In the end though, Bridge Constructor Portal really ups the ante for this very specific subgenre by bringing together the simplicity of building bridges and the charismatic elements of the Portal universe. With a variety of challenges to face, this puzzler knows how to have fun while constantly challenging your mind with increasingly elaborate tests.